On Monday, a far-left leaning black college professor stated what few in the liberal media dare: if a white Republican said what Sen. Harry Reid (D-Nev.) did about presidential candidate Barack Obama in 2008, it would be huge news. 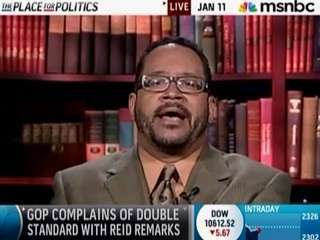 Speaking on MSNBC's "Morning Joe," Georgetown University Professor Michael Eric Dyson elaborated, "They would be making hay out of it, calling for his resignation. I think we're hypocrites and we're morally weak here." Here's the problem though: [Obama's] personal discomfort with race must not absolve him of responsibility as an American president. We don't expect you as a black president to deal with race. We expect you as the President of the United States to address this. And I think that he's being shown short here. He's shown that he's not really capable. Shocking stuff, but likely quite accurate. After all, Obama showed with his dismal response to the Professor Gates/Cambridge police department episode that he really doesn't know how to deal with matters pertaining to race despite his bold promises during the campaign. DYSON: I think that we should push the President. This president runs from race like a black man runs from a cop. What we have to do is ask Mr. Obama to stand up and use his bully pulpit to help us. He is loathe to speak about race. Shocking stuff to say the least. Will Obama-loving media ever see the truth?